Cricket Wagner of St. Pete Beach, Florida’s, Sirata Beach Resort says resort guests needn’t be thirsty when they gather during the evening to watch the sun lower itself in the sky. 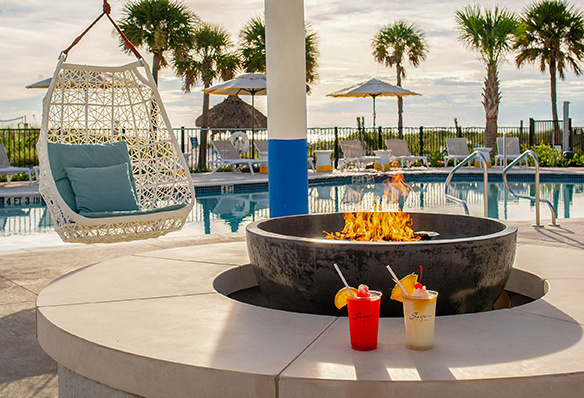 The Gulf Coast-fronting resort this year began posting the times of area sunsets, and inviting guests to enjoy 30 minutes of free beer, wine or rum punches as they watch the nightly spectacle. The Sirata Beach Resort sits on 750 yards of beach, with Wagner noting that guests will find a private beach, unusual for the area, and which ensures that those guests won’t have to share space with huge numbers of fellow tourists. There are two beach lounger chairs for each room. The property has this year being seeing a US$15-million renovation that has included new flooring, TVs and designs in the 382 guest units. As well, its Harry’s Beach Bar has seen its two pools merged into what Wagner labels “one massive pool” and a kids’ zone as well. A second beach bar – Rum Runners – is “getting a whole new facelift,” Wagner continues. Rum Runners’ pool is seeing the likes of trivia challenges and bingo for both children and adults. The beach itself features what Wagner calls a “sugary white sand” and guests will find 18 restaurants within half a mile. Sirata Beach Resort itself has a choice of restaurants. Management can offer an all-inclusive type of experience for incentive groups, and the resort has 30,000 square feet of indoor and outdoor meeting space. All meeting rooms have natural light. More information can be found at sirata.com.